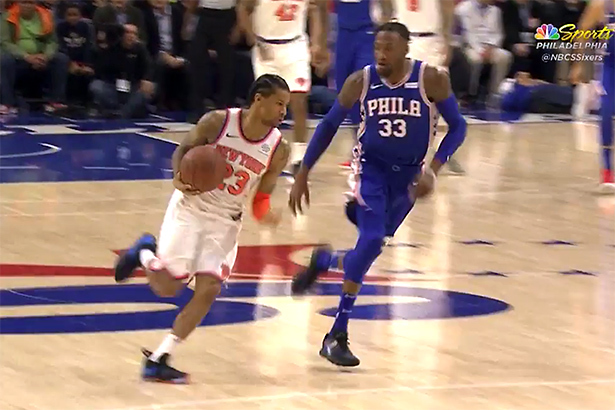 Michael Beasley and Emmanuel Mudiay led the Knicks with 22 points each but the effort wasn’t enough against a much more motivated 76ers team that have clinched just a few days ago a playoff spot for the first time in six years, and dropped 118-101 at the Wells Fargo Center. Trey Burke, who posted career numbers in the previous matchup, scored 18 points and dished 6 assists in his third start with the Knicks, while Enes Kanter dropped his usual double-double with 17 buckets and 14 boards. The Sixers were led by Dario Saric with 26 points and 14 rebounds, followed by JJ Redick who scored 21. Joel Embiid suffered a game ending injury in the second quarter after colliding with teammate Markelle Fultz but the team reported after being tested at the hospital that there was no concussion.